(AP) -- Beneath the lush, green hills of eastern Utah's Uinta Basin, where elk, bear and bison outnumber people, the soil is saturated with a sticky tar that may soon provide a new domestic source of petroleum for the United States. It would be a first-of-its kind project in the country that some fear could be a slippery slope toward widespread wilderness destruction. While tar sands projects are relatively new in the U.S., Canada has been a major producer for years, and in doing so, has become the No. 1 foreign supplier of oil to America. 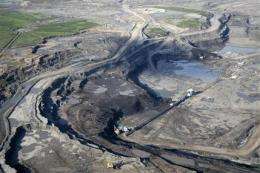 Alberta's sprawling oil sands deposits are the second largest oil reserves in the world outside of Saudi Arabia. The region produces about 1.2 million barrels of oil a day with an estimated 174 billion barrels in reserve. But it comes at a cost. The oil sands operations, including extraction and processing, are responsible for up to 4 percent of Canada's greenhouse gas emissions, and that's expected to triple to 12 percent by 2020. Unconventional oil - petroleum in any form other than fluid - has been eyed by the industry for years but largely considered not economically viable until recently. The major source of unconventional oil in the U.S. is shale, rock with all the necessary ingredients that wasn't buried under the right conditions to produce oil. But it's all getting a fresh look now as the untapped reserves are being seen as part of the future of domestic supplies. And while companies are still determining whether shale production makes economic sense, Canada's booming oil sands industry has eyebrows raised and wallets open. Generally, oil from oil sand costs roughly $20 a barrel to produce, about a few dollars more than pumping liquid oil. The initial Utah mine would be Earth Energy's first commercial effort at extracting oil from sands. It's unclear why the company chose Utah instead of staying closer to home where oil sands are bountiful. The company declined to say, but officials insist the project won't pollute anything and will leave Utah's oil sands as clean as beach sand after processing with a citrus-based solvent. "We are insuring that we won't pollute by complying with the regulations and as indicated with the project being approved," said company CFO Glen Snarr. Environmentalists aren't buying it and don't want any part of it in this country. They've been fighting a 1,900-mile pipeline proposed by another Canadian company that would carry crude extracted from Alberta's tar sands to refineries in Texas. The Keystone XL pipeline would double the capacity of an existing pipeline from Canada, delivering more than 500,000 barrels a day. According to a report commissioned by the Obama administration, the pipeline, coupled with a reduction in overall U.S. oil demand, "could essentially eliminate Middle East crude imports longer term." Susan Casey-Lefkowitz, director of the International Program at the Natural Resources Defense Council, says the rewards simply aren't worth the risks. "Refining the oil (from tar sands) creates more greenhouse gases than traditional crude," said Casey-Lefkowitz. "With projects such as Keystone, we have concerns such as pipeline leaks due to the corrosive nature of the bitumen and the high temperatures in which it would be transported." Oil sand is like black tar melded onto sand and clay. Reserves are found in Utah and a few other U.S. states, but America's neighbor to the north has by far the continent's largest deposits. And while most oil sands are easy to get to by strip mining similar to digging out coal, separating the oil from the sand takes a lot of water and energy. In Canada, there's even been talk of building a nuclear power plant simply to supply the industry, a move conservationists there have been fighting. Environmentalists in the U.S. say they don't want to see a Canadian-style oil sands industry crop up here, and are concerned that water pollution generated in the process could poison underground aquifers and wildlife in the region. In 2008, more than 1,600 ducks died after landing on a northern Alberta toxic waste pond that contained pollution generated in the oil sands separation process. Dozens of such toxic pools have been building up over 40 years in the region. Earth Energy says it will deploy a "revolutionary" new extraction process in Utah using a citrus-based solvent that "leaves behind no toxic chemicals" or the need for retention ponds, ensuring it doesn't harm wildlife or other natural resources. Still, environmentalists fighting the project believe the strip mining could cause just as much harm. Rob Dubuc, a lawyer working with Living Rivers, said the group is concerned about groundwater and downstream pollution. "Rain will ... wash pollution from the sands into the ground further tainting the porous soil and groundwater," Weisheit said. The state Division of Water Quality hasn't yet responded to the group's appeal. But Rob Herbert, a manager in the agency's Ground Water Protection unit, said the project qualified for a permit, in large part, because of the citrus-based solvent the company says it will use. He said the area also lacks substantial groundwater, meaning there would be little risk of aquifer pollution. "They are still obligated to protect groundwater and it does not absolve Earth Energy Resources from that responsibility," Herbert said. In the end, despite all the debate, experts say projects like the proposed Utah mine are an afterthought when it comes to satisfying the U.S. demand for oil. "If this project only produces 2,000 barrels of oil a day, it's irrelevant in terms of the 19 million barrels the U.S. consumes a day. It's not contributing anything to national security," said Richard Fineberg, a pipeline analyst with Ester, Alaska-based Research Associates. "With the cost, energy and amount of water that is used, it does not seem economically feasible, whereas investment into conservation and alternative energy is renewable each year." "I don't care where you get 'em, just bring 'em young! "